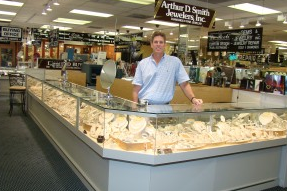 Arthur D Smith Jewelers, Inc. has been located in the International Jewelers Exchange since the International Jewelers opened their Boca establishment. We specialize in unique, high quality designer jewelry and diamonds. We exclusively carry the lines of such designers as Favero ( Italy), Roberto Coin, G. Verdi, Oliva, Gregg Ruth, Yevel, (Israel), Sophia Designs, W.R. Designs and many others. We continue to exceed customer expectations by providing exceptional service and expert repairs on all fine jewelry. Stop in and say hello to Arthur for that personal touch he offers all of his clients.